Since then, “green pasta” has become a staple at our home, perhaps as common as mac ‘n cheese is on most other tables. We prepare pesto and hold it refrigerated during most of the year. In the cooler months we buy two full plants a week from the vegetable market, and quickly process it into sauce to preserve the wonderful flavor. 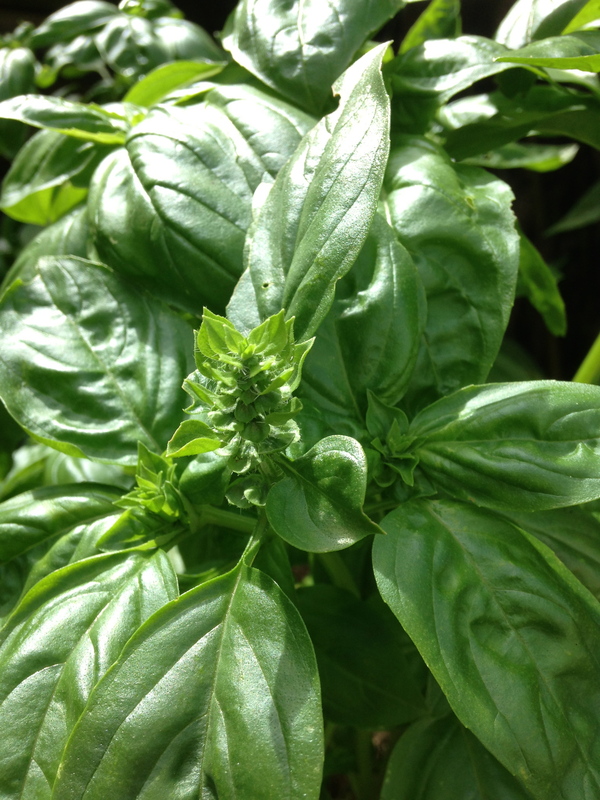 Since we started gardening, Basil has of course been a main component of our garden, but it took us a couple of years to get into the rhythm of producing enough for our own needs. We put the basil plants in the ground the weekend of Mother’s Day (when the risk of frost ends in our area). We have figured that 15-16 plants hold us up for the summer once in full production. Three weeks ago we had our first significant harvest of leaves, since the cool days lingered longer than usual this year. 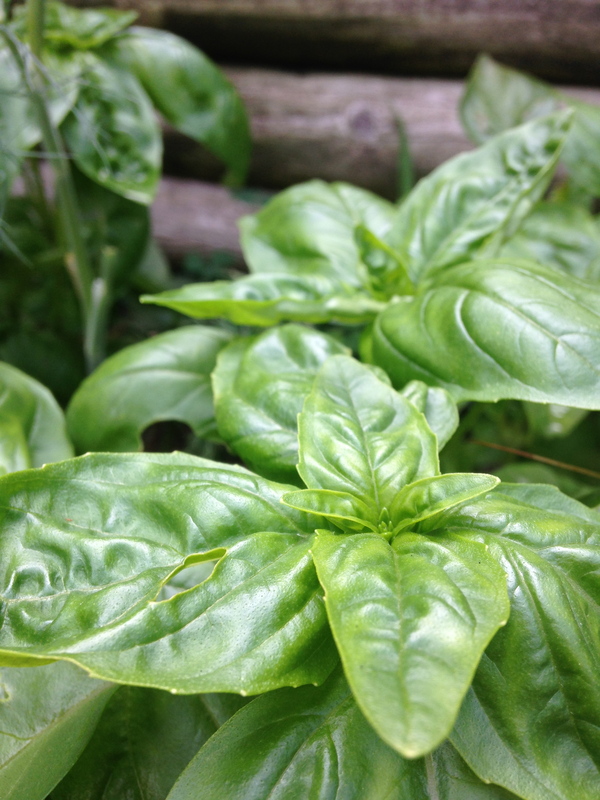 Every Friday we harvest the basil early in the morning, as the the flavor is stronger at that time of day. We clip off the top 1/3 of the plants leaves, to keep the plants from producing mature flowers and going to seed, so they just keep on getting bushier with every harvest. We do use the young flowers and the very tender stems near the top, but discard the tough stems right next to the plants to compost. Our weekly production is equivalent to what you get from two full grown basil plants from the vegetable market. Our son, H, is responsible for making the pesto immediately after the leaves are collected. Our version of the Basil Pesto sauce can be made in a few minutes. After washing the leaves in cold water, place them in a blender or food processor with 2-3 garlic cloves and 1/2 cup of olive oil. Blend at high speed until a thick paste forms, adding extra olive oil until all plant material has been processed. Add 1/2 to 3/4 cup of parmesan cheese to the mixture an continue blending until homogeneous. And it is done. Some recipes call for pine nuts, but we find it does not add much to the flavor, and given the price of pine nuts we’d be flat broke by now. We keep the pesto sauce refrigerated in a closed container until we need to use it. If it is too thickwe mix a couple tablespoons of the water where we cooked the pasta with the portion of pesto we are going to use at the moment. Our garden is now producing enough to make a quart of pesto sauce a week. I was hoping to start freezing it and saving it for the winter months, but so far we have eaten all our production…I told you, we go through that stuff real fast. For the Pesto recipe, pine nuts can be substituted with walnuts or pecans, I have even used almonds. Thank you for the tip Angie. Today is Friday so we made a new batch of pesto with raw almonds. Love the texture and taste.